Edible flowers are such beautiful and versatile food decorations. Begone, enormous nauseating piles of buttercream icing in weird colours. Never darken my doorstep again, boring shredded leaves. Shoo, silver balls, it is edible flowers from here on in. They're also a really fun garnish to prepare. 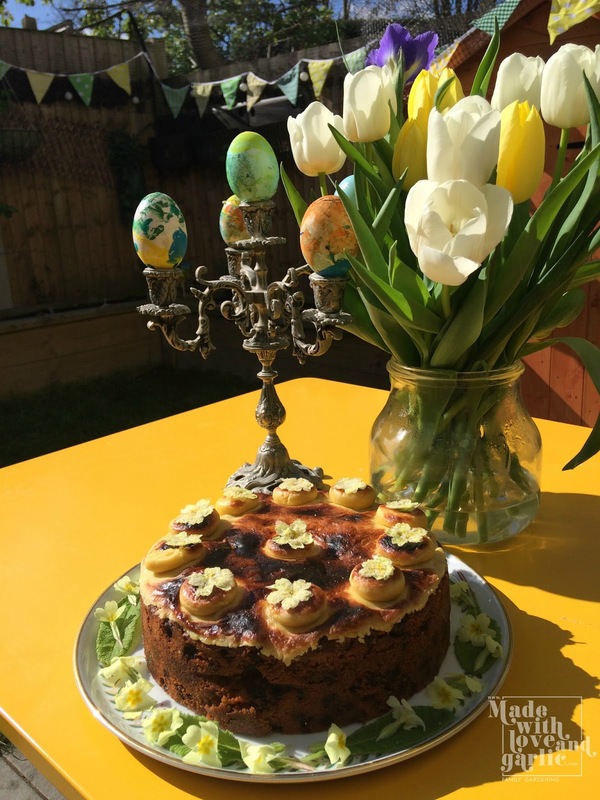 I make a traditional Simnel cake every year on Easter Sunday and like to dress the usual eleven marzipan balls with a pretty primrose to make the cake look light, bright and spring-like. 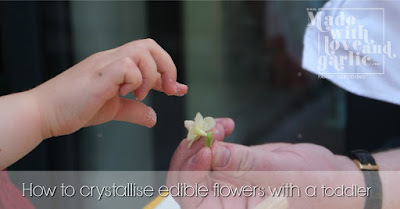 This year I thought that it might be fun to get my two year old son GarlicBoy to help crystallise our flowers. I had to buy some organic edible primroses from a local farm because my Primrose seedlings didn't grow fast enough this year. I'll have to plant them earlier, and inside next year! I got a box of 70 which seemed excessive at the time but actually was a good thing once we'd been through the "practice" ones! 1. (ADULT) Crack the egg and separate the white into the bowl. 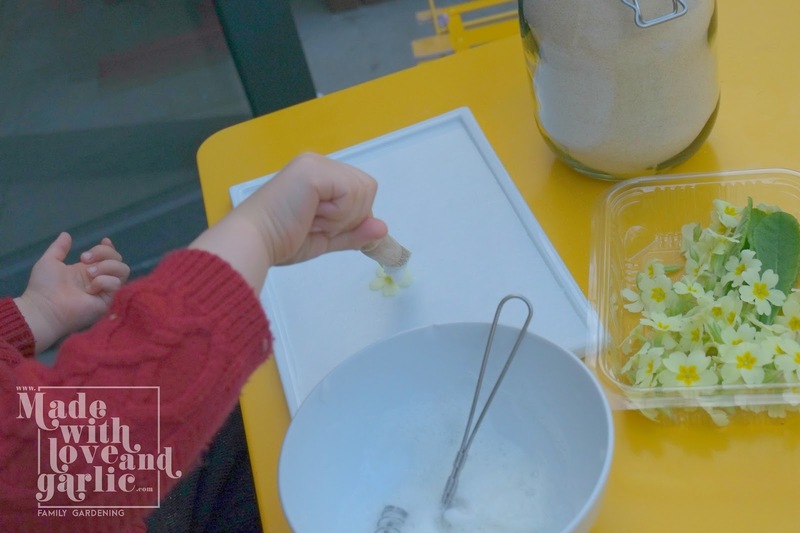 (CHILD) Have your small person whisk the egg white lightly until it it a little bit bubbly. 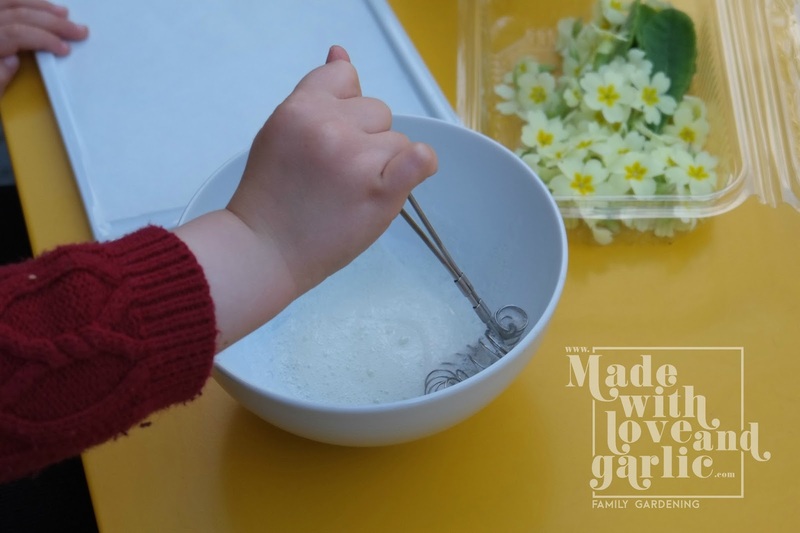 At two years old GarlicBoy had a marvellous time splashing the whisk about and watching the little bubbles rise. (ADULT) Take over and make sure the egg white is frothy. 2. (TOGETHER) Check the flowers over for tiny travellers. We found quite a few little insects on our flowers and GarlicBoy enjoyed the hunt. 4. 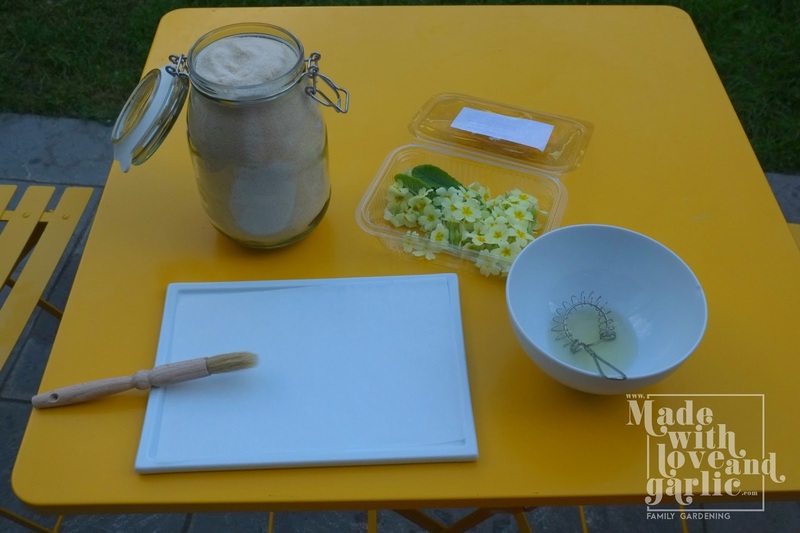 (ADULT) Demonstrate gently painting the petals with the egg white, doing the front first and then the back of the petals before you sprinkle them lightly with sugar and put them down on the greaseproof paper. (CHILD) Have a blast painting the flowers! 5. 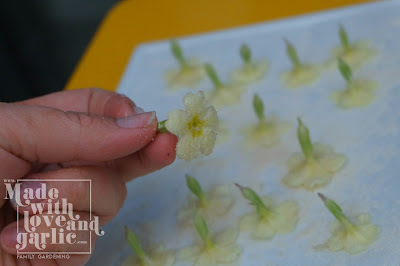 Once they're done, the (ADULT) can go over the flowers again quickly to ensure that the petals were all thoroughly painted and sugared (as this is what preserves the flower). 6. 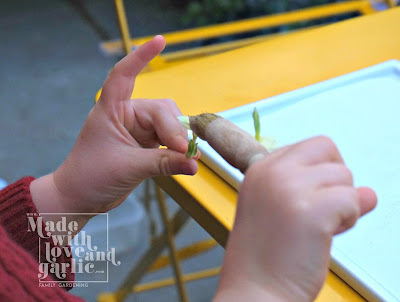 Leave the flowers on their paper somewhere relatively cool (I used the kitchen island) and pick them up off of the paper a couple of times over the next 24 hours to stop them sticking. Then you can put them on the cake that you've prepared. I used a bit more egg white to stick them on as I was grilling the marzipan top of the Simnel cake but you could use a little warmed apricot jam or similar. - GarlicBoy really enjoyed this, and then nibbled on an extra flower when we were done. But make sure that you check a reputable source for information on whatever flower you're crystallising because some can be toxic in large doses. - The UK Food Standards Agency recommends that any vegetation should be washed before being consumed. I found that this really damaged the flowers and so only washed some. But you need to make your own decision on this.